We are delighted to share the books chosen for the next season of the BBC Radio 2 Book Club with Jo Whiley! Every fortnight on Mondays from 7-9pm a different book will be discussed, starting on Monday 1 April. The Book Club will continue to showcase the best brand-new fiction, with a live interview between Jo Whiley and the author, as well as a review from one of our brilliant reading groups. In Edwardian Suffolk, a manor house stands alone in a lost corner of the Fens: a glinting wilderness of water whose whispering reeds guard ancient secrets. Maud is a lonely child growing up without a mother, ruled by her repressive father. When he finds a painted medieval devil in a graveyard, unhallowed forces are awakened. Maud’s battle has begun. She must survive a world haunted by witchcraft, the age-old legends of her beloved fen – and the even more nightmarish demons of her father’s past. Spanning five centuries, Wakenhyrst is a darkly gothic thriller about murderous obsession and one girl’s longing to fly free. Ambitious businesswoman Mae Yu runs Golden Oaks – a luxury retreat transforming the fertility industry – where women get the very best of everything, so long as they play by the rules. A brilliant, darkly funny novel that explores the role of luck and merit, class, ambition and sacrifice, The Farm is an unforgettable story about how we live and who truly holds. Honest and raw, this is a timely exposé of the dark underbelly of the fashion industry in an era of #TimesUp and #MeToo. Nuri is a beekeeper; his wife, Afra, an artist. They live a simple life, rich in family and friends, in the beautiful Syrian city of Aleppo – until the unthinkable happens. When all they care for is destroyed by war, they are forced to escape. But what Afra has seen is so terrible she has gone blind, and so they must embark on a perilous journey through Turkey and Greece towards an uncertain future in Britain. On the way, Nuri is sustained by the knowledge that waiting for them is Mustafa, his cousin and business partner, who has started an apiary and is teaching fellow refugees in Yorkshire to keep bees. As Nuri and Afra travel through a broken world, they must confront not only the pain of their own unspeakable loss, but dangers that would overwhelm the bravest of souls. Above all – and perhaps this is the hardest thing they face – they must journey to find each other again. 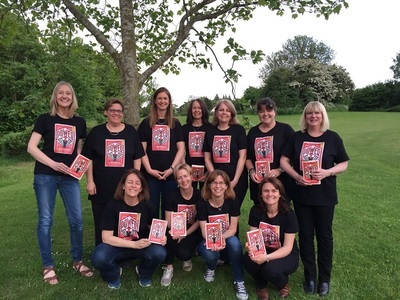 The Reading Agency works with librarians from across the UK to help Radio 2 choose the books featured on the Book Club. Hundreds of books are submitted by publishers and read by a fantastic panel before we meet to choose a shortlist. Find out more about the librarian panel. In the new format of the Radio 2 Book Club, each book is read and reviewed by one of our brilliant reading groups. Then, the BBC come to record their meeting and play it live on the show! If you are interested in your reading group taking part in this, please do send us your details. Want more offers for your reading group? Visit our Noticeboard for the latest opportunities. Looking for reading ideas? Visit our Book Reviews page for the latest themed reading lists. This month we’re looking at books that have been adapted for the stage. Are you planning to read any of the new titles on the Book Club? Have you read the classics either on your own or as part of your group? You can leave reviews of the books on our website. Planning to buy some of the titles for your group? Buy books from Hive and support The Reading Agency and local bookshops at no extra cost to you.